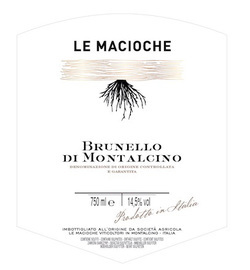 Classification: Brunello di Montalcino D.O.C.G. Vinification and Maturing: Grapes are manually sorted on the conveyor belt and vinified in conical trunk wood vats. Fermentation occurs with wild yeasts, careful ‘rimontaggio’ (pumping must over the dregs), and scrupulously controlled temperatures. This process is slow and may take up to thirty days. Once the malolactic fermentation is complete, the wine is placed in 30 hectoliter French oak barrels where it is then aged for 40 months. Organoleptic characteristics: Intense ruby red with splendid tones. Aromas of ripe blackberries and plums with a bit of Mediterranean underbrush. On the tongue , supple cherry flavors and hints of vanilla.